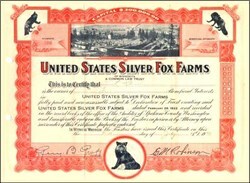 Beautifully engraved certificate from the United States Silver Fox Farms issued in 1923. This historic document has an ornate border around it with vignettes of foxes and a farm. This item is hand signed by the company’s president and secretary and is over 78 years old. The certificate has been folded and has 2 holes on the outside of the border. This is one of the nicest fox certificates we have seen.